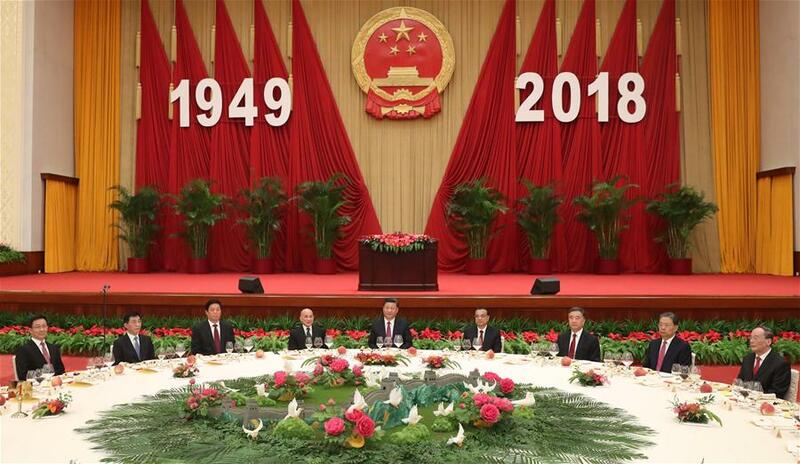 BEIJING, Sept. 30 (Xinhua) -- China's State Council held a reception Sunday, ahead of the National Day on Oct. 1, to mark the 69th anniversary of the founding of the People's Republic of China. Party and state leaders Xi Jinping, Li Keqiang, Li Zhanshu, Wang Yang, Wang Huning, Zhao Leji, Han Zheng and Wang Qishan, as well as over 1,200 guests from home and abroad, including Cambodian King Norodom Sihamoni, attended the reception at the Great Hall of the People. Premier Li Keqiang addressed the reception while Vice Premier Han Zheng presided over the reception. Li said that China will firmly uphold rule-based multilateralism and promote opening-up on a higher level. While safeguarding its own development interest, China will open wider to share development opportunities and progresses with other countries, Li said. Noting that this year marks the 40th anniversary of China's reform and opening-up, Li said nothing would undermine the country's resolve to push forward reform and opening-up. He said China will continue to comprehensively deepen reform and unleash and develop productive forces under the guidance of Xi Jinping Thought on Socialism with Chinese Characteristics for a New Era. China will work to advance reforms and strive to create a better business environment through streamlining administration, cutting taxes, lowering fees, and intensifying protection of intellectual property rights, Li said. He also said that China will encourage innovation among entrepreneurs and scientific and technical personnel, foster new drivers, push forward the high-quality development of the economy, promote international cooperation under the Belt and Road Initiative and improve people's livelihood. Li summarized major progress in various reforms, economic restructuring, opening-up, international cooperation, people's wellbeing and social stability. "China has handled new challenges at home and abroad with composure and concentrated its efforts in addressing domestic affairs, enhancing the endogenous dynamic of economic development, defusing risks with multiple measures, and keeping its economy operating within a reasonable range," he said. Li reiterated the policies of "one country, two systems," "the people of Hong Kong governing Hong Kong," "the people of Macao governing Macao," and a high degree of autonomy for both regions, and the need to deepen exchanges between the mainland and Hong Kong and Macao regions for common prosperity and development. "We will continue to uphold the one-China principle and the 1992 Consensus, safeguard national sovereignty and territorial integrity, and absolutely not tolerate any 'Taiwan independence' attempts and activities," said Li. China will unswervingly stick to the road of peaceful development, work with the international community on improving global governance, and promote the building of a community with a shared future for humanity, Li said.